I’ve wanted to play Escape from 100 Million B.C. ever since I read about its theme. I try not to go into games with extremely high expectations, but I just couldn’t help myself in this case. This Escape from 100 Million B.C. 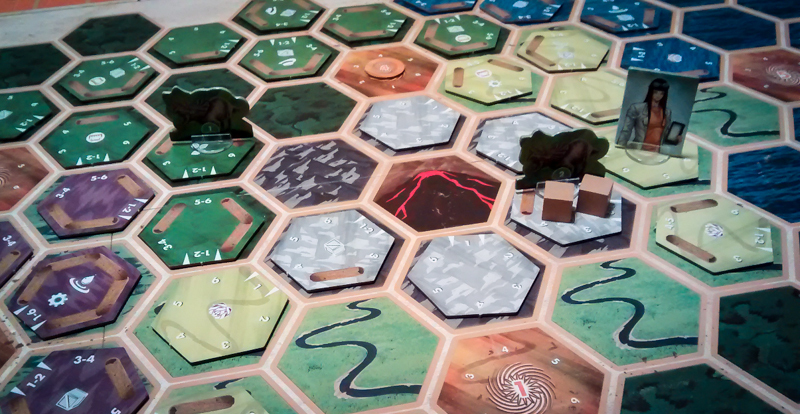 review is based on two solo games, one three-player game, three four-player games, and one five-player game. What is Escape from 100 Million B.C.? 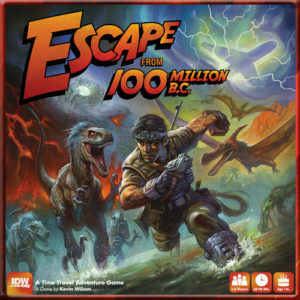 Escape from 100 Million B.C. is a cooperative adventure game designed by Kevin Wilson (Elder Sign, Cosmic Encounter) and published by IDW Games. You are part of the very first time-travelling expedition, but unfortunately you are now stranded in 100 Million B.C. after you crash-landed on top of a volcano. You and your fellow time-travelers’ job is to collect all of the parts to your time machine and as much equipment as you can before you come back to the future. However, you will not be alone in 100 Million B.C., as you will encounter dinosaurs, adventures, and even some famous faces that can alter the future if you aren’t careful. Sounds awesome, right? I know!! I’m not going to go over all of the Escape from 100 Million B.C. 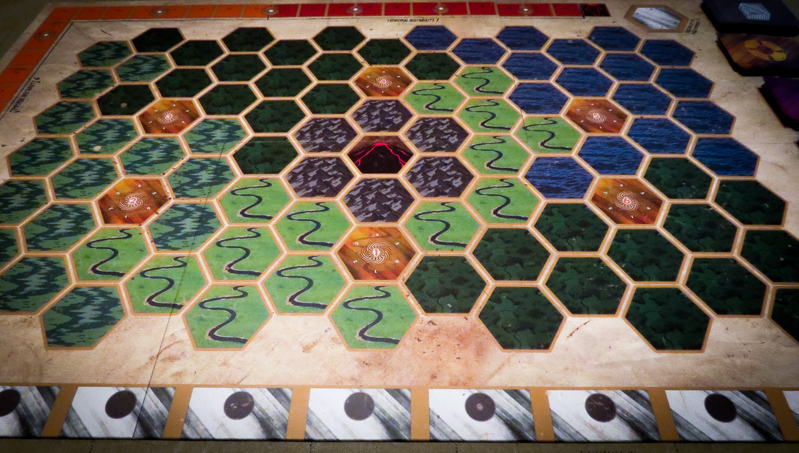 rules here, but hopefully you will get a feel for how it plays and if it’s something you might be interested in. At the beginning of the game, players will get a character sheet and equipment cards. The sheets will tell you the stats your character has, including brawn, speed, will, and health. Each character also has unique special abilities that they can use. Throughout the game, you will be moving around the (huge) game map attempting to find the missing parts to your time machine and any equipment that fell out of the machine upon impact. Every time you move to an unexplored area, you will flip over a tile of that terrain type and find out what’s there, if anything. When you encounter a dinosaur, adventure, or time castaway (a famous person from the future), you will have a chance to interact with them. This is what you’ll be doing most of the game, but you’ll usually have to talk with your group about how you’ll approach each encounter. When you encounter a dinosaur, you’ll attempt to fight, repel, or flee from it. You do this by checking your character sheet for the skill you’ll be using, then rolling that amount of dice. If you fight the dinosaur and win, you’ll get them off the board but you’ll also make the “paradox” level go up. If you lose, you’ll take wounds and the dinosaur will stay on the board. Let’s talk a bit more about that paradox track. That thing will stress you out! As the level rises, you will be getting closer to the volcano erupting and you’ll open up time rifts, which bring in time castaways. When time castaways show up, you’ll be hoping to send them back through those rifts before you head home so they don’t alter the future too much. Unfortunately, they move around the map at the end of each round and can be killed by the dinosaurs. However, you can also get them to follow you, giving you additional skills until you’re hopefully able to send them back through their time rifts. When you encounter adventures, you’ll simply pick up a card from the adventure deck and find out what happens and what you need to do. In most cases you’ll have to do a skill check of some kind and you can sometimes get one of your time machine’s parts when you’re successful. As I mentioned, your main goal is to pick up the time machine’s parts and the equipment. You always have to deal with the encounters before you can pick any of these things up, but after that you can put them on your character sheet without using one of your movement actions. You’ll use the equipment to get bonus skills, and you’ll be trying to get the time machine’s parts back to the volcano space. If you’re able to get all of the time machine’s parts and everyone gets back to the volcano area where you crashed, you win… maybe. Any equipment you’ve left behind will raise the paradox level and all remaining time castaways die, raising the paradox level even more. 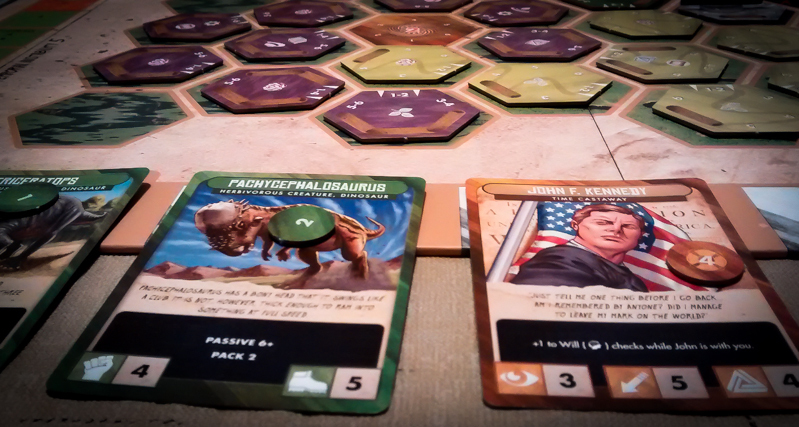 If at this point the paradox level is still below the volcano space, then you win… kind of. You’ll need to compare the paradox value to the Future Results Chart in the rulebook to see how you’ve altered the future. The theme really shines here. I had high hopes because of the time traveling theme, and I was not let down. Everything you do makes sense, from searching for the time machine’s parts to having a “passive” dinosaur go away simply because it’s not interested in fighting you at that moment. It’s great that you can attempt to “win” in multiple ways. You can try to keep the land clear of dinosaurs and slowly find the time machine’s parts, or you can attempt to flee from most of the dinosaurs and get those parts as quickly as you can. We still haven’t found the best strategy, if there is one. There is so much replay value here. The random tile placement, the random card draws, and the different character combos ensures that no two games will be alike. The time castaways are awesome! Not only is it cool to interact with these famous people from the past… or… future, but they also enhance the theme quite a bit. We’re not always fans of the “check your score at the end of the game to see how you did” thing, but we really like it in this case. They have a huge list of outcomes based on where the paradox track is at the end of the game, and it’s always fun reading it out loud to the group. The Escape from 100 Million B.C. rulebook isn’t actually too bad, but since it is about 30 pages it would’ve been nice if they had put a rules summary page on the back of the book. Expect to be referencing that rulebook quite a bit in your first three or four games. We really like the artwork on the cards and board, but the art on the characters’ sheets and standees is a bit bland. Multiple people in my group mentioned that they wished they used a similar art style on the characters as they did on the time castaways. Minor issues aside, everyone I’ve played Escape from 100 Million B.C. with so far has loved it. That’s mostly because of the awesome theme, but it’s also because it forces you to talk out how you’re going to approach everything on the board. It has a great adventure theme to it and it’s the type of game that will take a while to master (even at the lower difficulty levels). It’s definitely one of the best cooperative adventure games we’ve played in recent years. The only people who I would not recommend this game to are those who aren’t interested in the time-traveling theme. Oh, a quick tip if you do plan on buying Escape from 100 Million B.C.. Don’t look through the decks of cards before you play your first game! It makes exploring so much more exciting. Thanks for taking the time to read our Escape from 100 Million B.C. review! And thank you to IDW Games for providing us with a copy of this game.